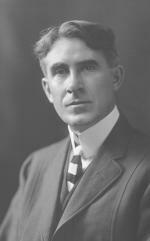 The name Zane Grey had become so synonymous with the American West that on the writer’s death, in 1939, even the august New York Times chose to memorialize his achievement on its editorial page. "A cultivated man," observed the anonymous eulogist, "[Grey] told his Western tales to a generation that believed itself neither innocent nor simple. He made the East swallow the Western legend. That is, he must have made millions of us boys again. While the miracle is not permanent, it is something to be grateful for." And a significant legacy, certainly, for a writer who only opted to fill pages after he had realized how much he did not want to spend his life filling teeth. If Owen Wister planted the seed of what would blossom into the conventions that helped create the modern Western, Grey’s lush purple prose was its fertilizer, redefining the cowboy novel and, with it, a particular corner of American storytelling. Over time, his name became a brand that spread seamlessly from the page to the movies and then radio and television, linking the Zane Grey name with the genre he so molded. Through Grey's imagination, across dozens of books—including Last of the Plainsmen (1908), The Heritage of the Desert (1910), The U.P. Trail (1918), The Man of the Forest (1920) and, of course, Riders of the Purple Sage (1912), his best-known and best-selling novel—the West assumed the starring role of a breathing panorama, raw and rugged, marked by the poles of good and evil against which men tested the steel at the core of their character. Grey’s west was a violent place, but one that held out possibilities of redemption for those who subscribed to what Grey saw as a "Code of the West," defined by an idealistic set of values all Americans needed to embrace: loyalty, friendship, hospitality, integrity, generosity, and an abiding respect for the land itself. Pearl Zane Gray was born in 1872, the fourth of five children, in Zanesville, Ohio, a town founded by his mother’s family—his great-great grandfather came to America with William Penn. He would drop his first name, which he hated, and change the spelling of his last when he became a writer. His father was a dentist, part-time preacher, and full-time strict disciplinarian who actively discouraged his son’s earliest attempts to write stories, going so far as to tear them up. Growing up, Gray was only an average student but a dedicated fisherman, ballplayer, and reader of adventure tales. All three activities would play essential parts in his later life. As a young semi-pro, his strong pitching arm won him a scholarship to the University of Pennsylvania, where he starred on the baseball team and slogged through academically, earning a degree in dentistry. Zane Grey fishing in the Delaware River near Lackawaxen, PA, circa 1910. After graduation in 1896, he moved to New York, opened a dental practice, and wrote at night. On weekends, he continued to play baseball with an athletic club in New Jersey, turning down professional offers to focus on writing. 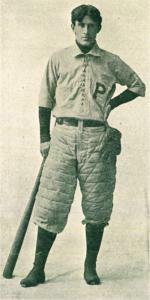 His older brother, Romer—who, as Reddy Gray, played parts of three undistinguished seasons with the Pittsburgh Pirates—joined him in the dental practice; years later he'd become the star of one of Zane’s most popular non-Western stories, "The Red-Headed Outfield." One afternoon in 1900, while the brothers were canoeing on the Delaware River near Lackawaxen, Zane met Dolly Roth, whom he married in 1905. Throughout their marriage, she managed his career and was his most important editor. In return, they split 50-50 whatever he earned writing. Even before they walked down the aisle, he had made it clear that it was not in his nature to remain faithful. Once married, he was absent for long periods from his family. Indeed, Grey's nature was complex and tormented. He was so plagued throughout his life by depression and anger that he called his mood swings "an hyena lying in ambush," candidly admitting, “I conquered one mood only to fall prey to the next…. I wandered about like a lost soul or a man who was conscious of imminent death.” Writing, he liked to say, allowed him the freedom to create a world that he could escape into. Grey published his first story, about a day fishing on the Delaware with his brother, in 1902, then sat down to write his first novel, a fictional account of his Zanesville ancestors, called Betty Zane, which Dolly edited, then paid to have printed when every publisher they’d submitted it to rejected it. Against all odds, the book was a success, and Grey gave up dentistry to write full time. Once married, the Greys moved to Lackawaxen, Pennsylvania, where he continued to write and publish as the couple supported themselves with her savings. Soon, though, the savings were gone, a son was born, and he was reconsidering his career when he met Col. C.J. (Buffalo) Jones in 1907. Grey joined Jones on his next trip to the West. For two years, Grey took copious notes and hundreds of photographs, but if the book he returned with, The Last of the Plainsmen, found few readers, Grey had finally found his enduring subject in landscape and stories he had encountered. His next book, The Heritage of the Desert, published in 1910, was his breakthrough. Then, in 1912, Riders of the Purple Sage turned Grey into a sensation and became one of the most successful novels of all time. Between 1912 and 1924, Grey had a book on the best-seller list every year but one, and his work regularly appeared in such major magazines of the day as McCalls, Outdoor Life, Colliers, and Cyrus Curtis's Ladies’ Home Journal. More than forty movies were made from his books, several of Purple Sage alone, with actors as diverse at Tom Mix, George Montgomery, and Ed Harris starring as Lassiter. Two other novels would be adapted into hugely successful radio and TV series: "The Lone Ranger" and "Sgt. Preston of the Yukon." His name became a brand; almost twenty years after his death, "The Zane Grey Theater," an anthology of episodic Western stories, ran for five years on network television. Though his novels earned Grey a fortune, they never received critical respect. "His art is archaic," complained a reviewer in the Saturday Review of Literature, "with all the traits of archaic art. His style has the stiffness that comes from an imperfect mastery of the medium." Still, with his popularity established and his fortune made—he was one of the literary world’s first millionaires—Grey continued to write until his death with great gusto at a rate, he boasted, of 100,000 words a month. And when he wasn’t writing, he was passionately pursuing his life’s other obsession: game fish. 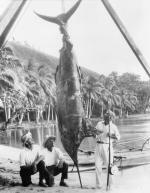 He took long fishing trips to points as far away as Australia and New Zealand, and setseveral sport fishing records with his catches. Never shy, he would wire the newspapers with the details. In 1918, Grey resettled the family, which had grown to two sons and a daughter, in Pasadena, California. In addition to his Westerns, he wrote several books on fishing and a series of baseball books and adventure stories for juveniles. His concern about the plight of the Native Americans was evidenced in one of his best-received novels, The Vanishing American, published in 1925, which featured a character loosely based on Jim Thorpe. Shortly before his death, Grey wired his publishers that he had three more completed manuscripts ready. Faithfully edited by Dolly Grey, all three were published posthumously. Both Grey’s ashes, and those of his wife, are interred in Lackawaxen. Zane Grey, Zane Grey on Fishing edited by Terry Mort (Guilford, CT: The Lyons Press), 2003. Stephen J. 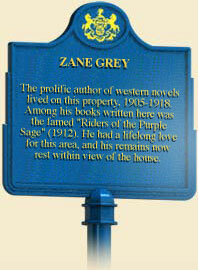 May, Zane Grey: Romancing the West (Athens : Ohio University Press), 1997.